Apple has surpassed Xiaomi to become the top smartphone vendor in China, according to the latest report from market research firm IDC. As per the report, the Cupertino-based tech giant shipped a total of 14.5 million units last quarter, capturing a 14.7% market share. This compares to the 13.5 million devices shipped by the five-year-old Chinese company, which translates into 13.7% market share. 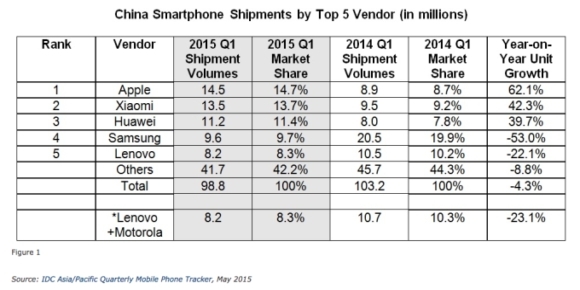 Huawei, Samsung, and Lenovo rounded up the top five with 11.4, 9.7, and 8.3% shares, respectively. In addition, the report also revealed that China's smartphone market, which is the largest in the world, saw 98.8 million units shipped in the quarter, which is a 4% year-on-year decrease. Notably, this is the first time since 2009 that the country's smartphone market has witnessed a decline. This is horrible. Apple is linked with US government. You'd think they would prefer more affordable and more advanced tech.